Happy Tuesday, dear readers! I hope this post finds you well and your week is off to a wonderful start. Sickness has hit the Jedi household AGAIN so this is likely to be a light week on the blog front until my little men are feeling better and letting me sleep. I did want to get a quick post up today so let's jump in and do this! 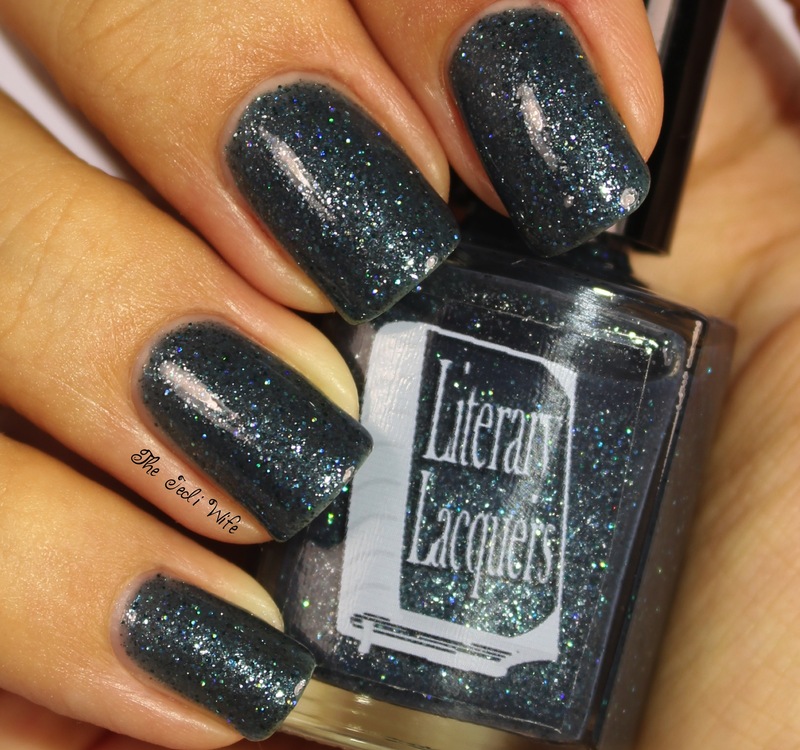 It is no secret that I adore the creations of Amy of Literary Lacquers. While I may not have the time to read like I used to, I've always enjoyed literature; having it combined with polish is such a great idea! I am a member of the Literary (&) Lacquers Facebook group, and we have a book club complete with discussion. If that wasn't fun enough, members submit inspiration photos and the group votes on the winning photo and polish vision. I participate in them as often as I can, and for today's post, I wanted to share the first book club custom polish. I Smell Rain was inspired by the book Divergent, and the winning polish idea and inspiration photo was provided by Cate Cropp. This gorgeous dusty dark blue polish contains gunmetal flakies, black holo microglitter and a touch of silver holo microglitter and iridescent blue microglitter. 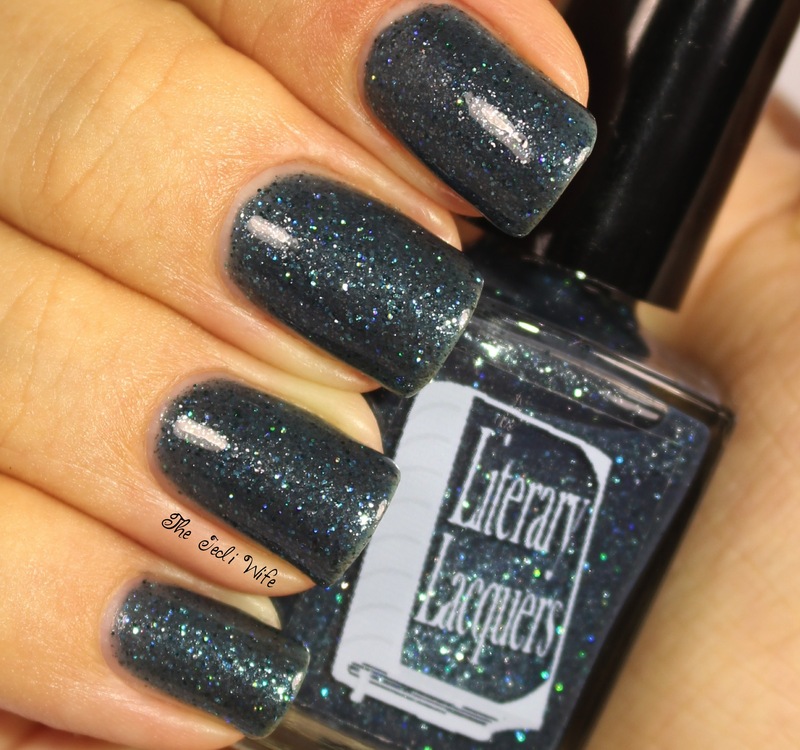 This polish was only available for a limited time for group members only, but there are other Literary Lacquers beauties available at the Literary Lacquers etsy shop located here. If you want to join in our book club and have the opportunity to design a polish and/or own book club customs, come join us on Facebook here. We're a pretty chill group, and as long as you're nice, we'd love to have you! I'm off to take care of a few things before I pass out tonight, and I hope you enjoyed tonight's blog post! I'll be back as soon as I can! Until next time, have a wonderful night! Oh I really love this! So sparkly! So pretty! I love the discussion and tone in the LL group. It's a great group of folks who have great taste in nail polish! This is so stunning! Lit Lacqs are always so complex! Pretty; I love the shimmer! I should really join the facebook group as I love reading and nail polish so it sounds like a win win! I want to pet this color for some reason! This polish is amazing! I loved wearing it. This is a beautiful and unique shade! I love greys! I wished it were a bit more opaque though. The glitter mix in this is gorgeous. Oh, Amy, you did good!! Jen, this is beautiful on you! Great swatch! Such a pretty unique polish! Super beautiful and so aptly named!